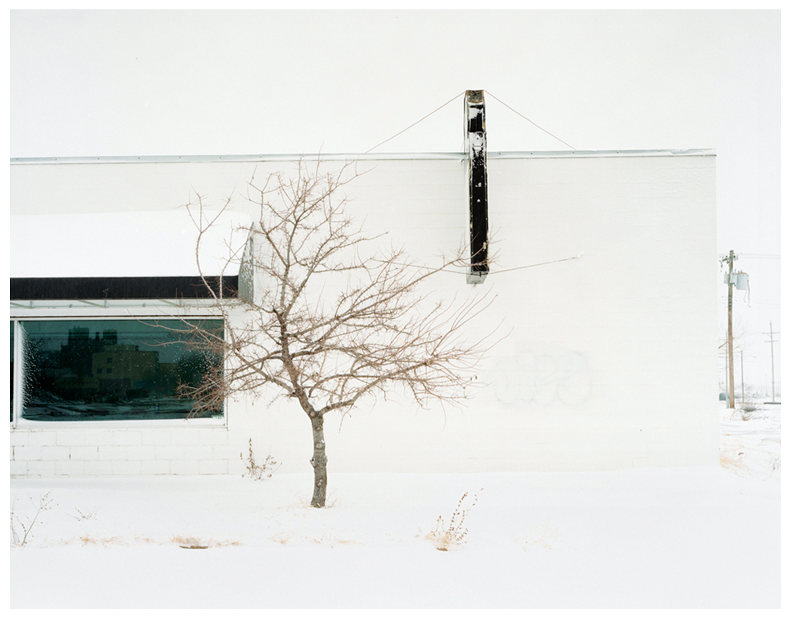 BOSTON Joe Johnson’s recent color photography series (titled “Local Weather” and made between 2010 and 2011) continues his explorations of contemporary human environments without the humans. 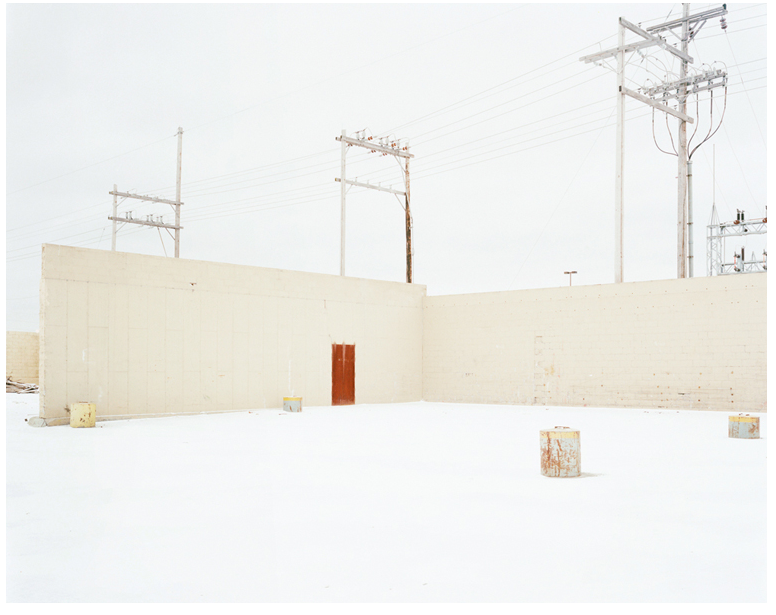 In an earlier series, Johnson depicts the cluttered topography of barren urban rooftops; in another, the theatricality and garish hues of empty mega churches. 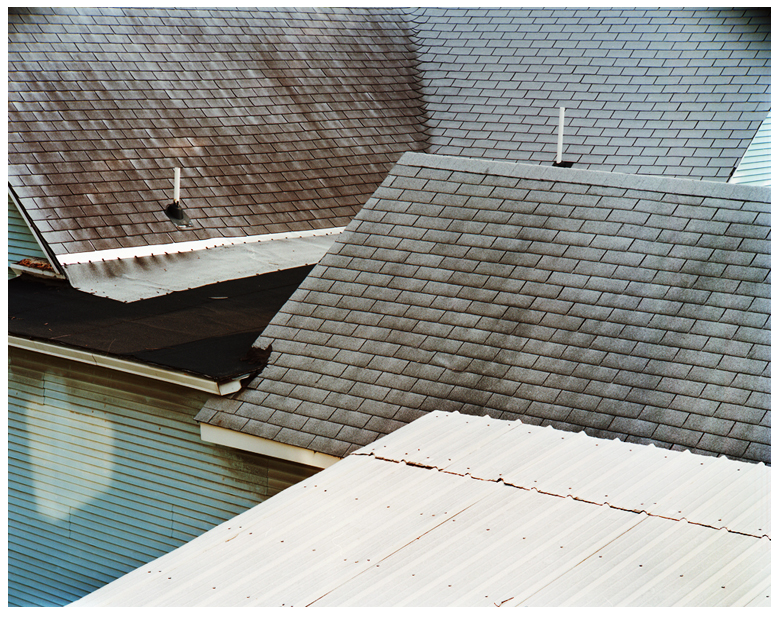 Here he focuses on depopulated midwestern landscapes—tract houses, strip malls, construction sites and farmlands—vacated due to blizzard or nightfall. The 10 snow scenes approach near white-out, while the five nocturnes are dense and dark. Johnson, who is assistant professor of photography at the University of Missouri in Columbia, received his MFA in 2004 from Massachusetts College of Art in Boston, where he studied with Abelardo Morrell and Nicholas Nixon. His large (40 by 50 inches) works are shot using color sheet film in existing light with a 4×5 field camera. Images are digitized, then printed via inkjet. 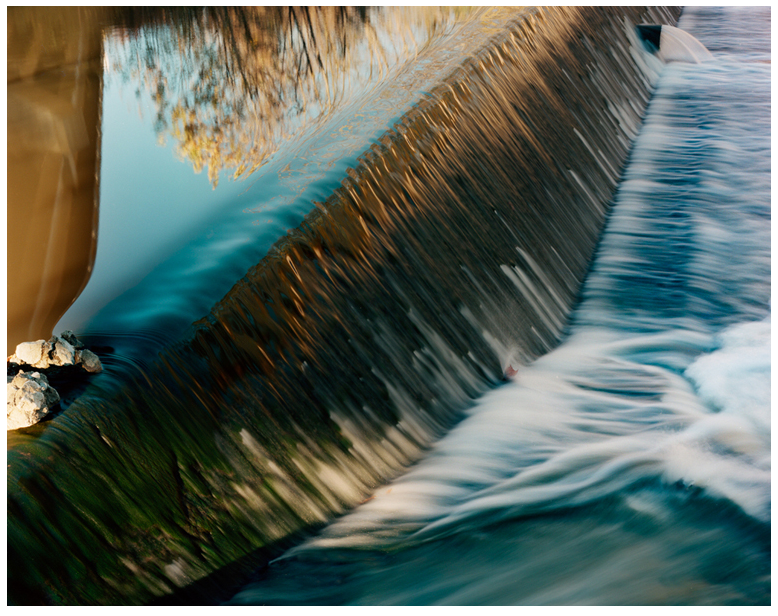 Unmanipulated color and minute details are absorbed from long exposure, delivering uncanny effects. In Two Homes, Manhattan, KS, Johnson’s viewpoint sinks both houses behind a dim hillock so that they appear partially buried. Last vestiges of sunset land on the apex of one rooftop, making a neon orange chevron pop out of the purple gloom. Beyond the effects of his timing and compositional cleverness, more gradual rewards emerge. The dark pictures especially contain slow-release magic. Night skies give up subtleties of navy, pink and taupe. In Snow Pile, Manhattan, KS, mounds of dirty snow appear as delicate filigree, and sodium-vapor streetlights feature tiny bands of color in their glow. In Duplex, Columbia, MO, a shimmer of light around a building corner adds a frisson to bland, frame-filling architecture. 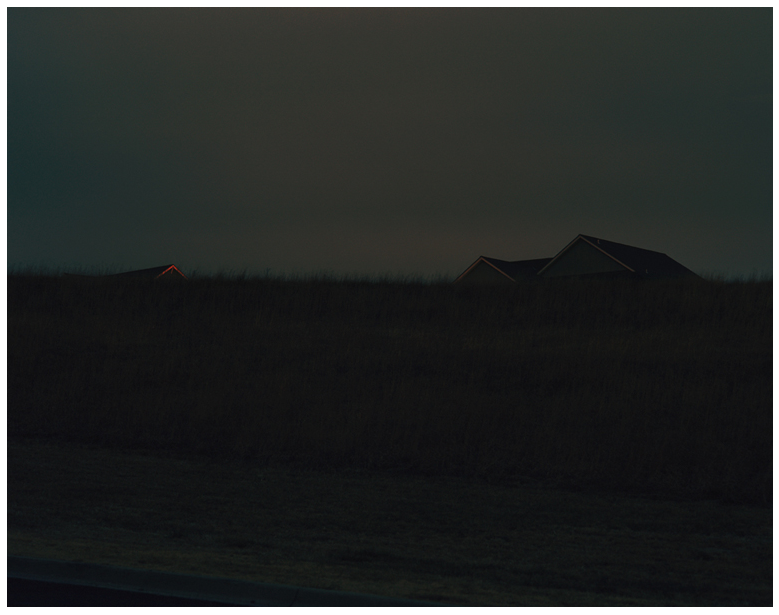 One House, Manhattan, KS shows a lonely, suburban dwelling in total gloom, except for an eerie pattern of lights behind a picture window: Christmas tree? House fire? Beauty lurks in the banality of the snowy scenes as well. In Courthouse, Columbia, MO, utility wires thread through the frosty haze like tenuously drawn lines. 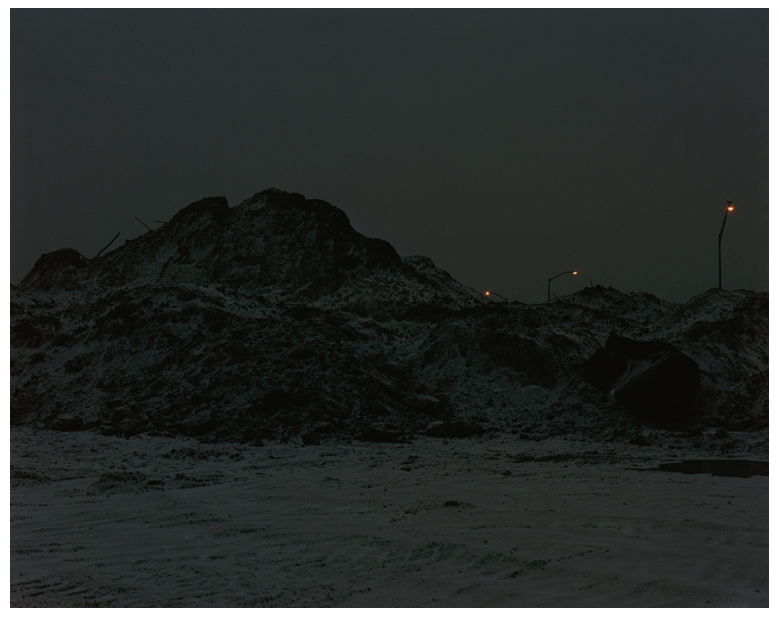 In Construction Site, Manhattan, KS, light absorbed by hoary air makes a snow-dusted dirt pile seem almost mystical. The frozen stubble of a cornfield in Frozen Crop, Near MacDowell, KS stretches to infinity like a homespun Anselm Kiefer—more accessible, less dramatic, just as bleak. Under the scrim of snow or darkness, Johnson’s normally no-nonsense heartland becomes ripe for local legend, allusive to cinematic settings. Aliens would pick places like these, one feels. So might the Coen brothers, or David Lynch. This entry was posted in Uncategorized and tagged Joe Johnson by msuphotoresources. Bookmark the permalink.